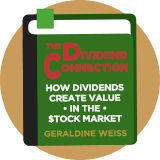 Geraldine Weiss Dividends is an income investing strategy based on some of the rules used by US investor Geraldine Weiss. The approach targets large capitalisation companies with relatively high yields, and uses the dividend yield as a measure of value together with quality factors. It buys stocks when their yields are close to their historical highs and then sells them when the yields drift lower. Weiss is reported to use 7 core criteria in her strategy, including a comparison of a stock's historic average yield with its current yield. Weiss said: "Dividends provide a cushion of safety when a stock starts going down. When the stock price drops, the yield gets to very attractive levels, so many investors will step in and buy, reversing the trend of the stock." Weiss has been writing the Investment Quality Trends newsletter since 1966. In January 2000, it began publishing a list of its top 13 picks for the upcoming year. Dubbed "The Lucky 13", these selections have generated a claimed average total annual gain of 15.18%. Known as the Grande Dame of Dividends, one of the most famous female investors in the world. Former editor of Investment Quality Trends. Author of Dividends don't Lie.